You bring your lunches. You turn off the lights as often as possible to save money on the electric bill. You wait until it hurts to hire. You’re using as many free Google Tools as you can because buying the Office software suite costs too much. How in the world can you afford to advertise your small business? The better question is: how you can afford not to, when you can do it for free? Yes, think of free social media networking platforms — Twitter, Facebook, Foursquare, for example — as free advertising. To be clear, you won’t need any money at all … but you will need time, patience and dedication to connecting with customers and potential customers this way. Here are a few small businesses that have embraced Twitter and Facebook marketing, building customer relationships and community goodwill. Some do it with information, some with personality, some with conversation. Whatever you see that you like, duplicate. Who wouldn’t want to know the answer to that? Dog day care is big small business now, and there’s a lot of competition for the affection and loyalty of dog owners. Dogtopia of Nashville built up a fan base of nearly 1,000 on Facebook by posting regular photo albums of the dogs at play. Mind you, obsessive dog owners can already watch their puppies frolic live on Dogtopia’s webcams, but this lets them share proud-dog-parent photos with their own Facebook friends, too. Plus, Dogtopia Nashville celebrates dog birthdays with posts, answers questions from concerned owners away on vacation, comments about dog rescue events and more, all on Facebook. They recently transitioned from a friend page to an official Fan Page, starting with zero followers, and the owner told me he was afraid he was committing “Facebook suicide.” If they keep up doing what they’re doing in the new place, there’s nothing to worry about. School started last week in Nashville … sort of. Students went for a half-day Thursday and all-day Friday. The savvy Facebook Page managers of the Metro Nashville Public Schools system anticipated that parents would want to talk about this odd introductory schedule and started a conversation. 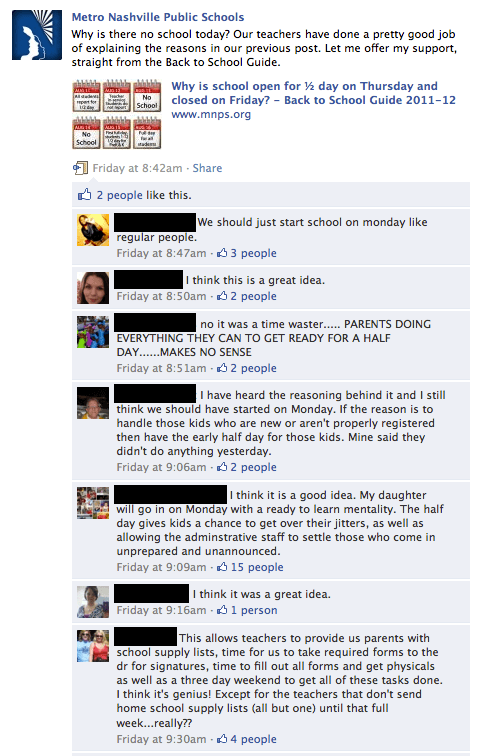 People definitely talked, and plenty more “Liked” the post and the viewpoints of other parents. Is there a potentially touchy subject related to your industry that could get people talking? The more they interact with your posts, the better your Facebook EdgeRank, remember, and the more likely your posts are to be seen again in your fans’ Facebook streams. Also, note that the Facebook wall post wasn’t just a question — it included a link to previously published content online explaining the school system’s view. Bonus points for driving people back to the site. If there isn’t a food truck or 20 in your town, be prepared for a new kind of Meals-on-Wheels invasion. In the meantime, you can learn a lot from these very small business owners and how they use social media. Twitter is often the exclusive advertising vehicle for these lunchtime, dinnertime and late-night food delivery systems, whose owners use the platform to announce when and where they will be. The element of surprise keeps followers interested, eager and trigger-happy on the Retweet button — and benefits the mobile chef who needs to tell people quickly that he ran out of pickle-flavored ice cream. The very best food truck Twitter accounts also share photos of their food and customers, respond to replies quickly and tweet links about events their patrons might enjoy. Here’s one for the ladies (and very brave men). Wax Pot Studio offers body hair removal services in Nashville — think bikini and brow areas — and owner Lynette Snyder is a hoot on Wax Pot’s Twitter account. She chats about heavy-hair days, updates clients on office changes and more (all while protecting her clients’ anonymity, of course). Plus, she answers common questions on Facebook and promotes them on Twitter for better cross-marketing. There’s no brilliant strategy here … just posts that will make customers smile when they show up in a Twitter stream or on a Facebook wall. It’s okay to be happy about your work, no matter what it is. Sure, many restaurant websites are horrifically bad. But other restauranteurs are busy winning over customers on Twitter. Take Zingerman’s Deli, an Ann Arbor, Mich.-based deli that has been around since 1982, but isn’t afraid of new-media marketing. They love to Retweet customers’ comments, announce adjustments to their menu and hours, and offer discounts or other make-good deals to anyone who had a bad experience and Tweeted about it. Any diner or potential diner who looks at the Zingerman’s Twitter stream can see exactly how happy they are to make things right. That leaves a very good impression. Then there’s Scott Wise of Scotty’s Brewhouse. If you’re a business owner with a big personality, and your personality attracts customers, social media networking is perfect for you. Scott’s Brewhouse Twitter account is just plain entertaining. Bonus points for offering discounts to people who use Foursquare to check in to his restaurant. Is there a local business that has a great Facebook Page or Twitter account that you enjoy? Why? Is is the personality, the information or the conversation that speaks to you most? Be sure to share links below. Arienne Holland is the Communications Director for Raven Internet Marketing Tools. Raven’s comprehensive platform helps small business owners research, manage and monitor social media networks, SEO, online advertising and more. Follow Arienne on Twitter at @RavenArienne or on Google Plus.